It is hard to believe that it has been 19 years since Disney’s “Beauty and the Beast” earned an Oscar nomination for Best Picture (1991). This timeless, classic tale was the first animated feature film ever to have this honor bestowed upon it, and it is as enjoyable to watch today as it has ever been. The transfer to HD is nothing short of spectacular. If you’ve been debating whether or not to make the switch from DVD to Blu-ray, watch “Beauty and the Beast” on Blu-ray and your decision will be made. The quality is truly remarkable. Packed full of special features, the Diamond Edition of Disney’s “Beauty and the Beast” provides hours of quality entertainment. Prepare yourself to fall in love with this movie all over again. Blu-ray Bonus Features: Disney has packed the Blu-ray with several new features, along with all of the classic DVD bonus features, including the original music video of “Beauty and the Beast,” featuring Celine Dion. 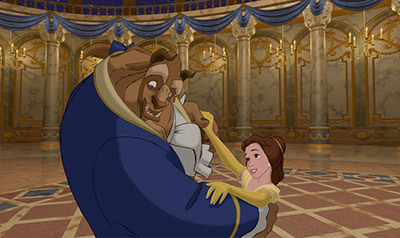 The viewer has the choice to watch the classic theatrical version of “Beauty and the Beast”, an extended version, or a picture in picture version of the original film, which shows the animation reel. Additionally, an alternate opening scene and a deleted scene are featured. The Disney Sing-Along Mode is a great option for little songbirds still learning the words to the wonderful songs, and of course, there is an audio commentary for the die-hard fans. The Blu-ray bonus features just keep on giving, as there is a new music video of the title song, performed by American Idol winner Jordan Sparks. Two interactive games are included, although one of them requires using your phones, which requires a fee. There are three documentary segments included. For fans of theater, “Broadway Beginnings,” about the Broadway play, features remarks by a number of the play’s performers, such as Donny Osmond, Jamie-Lynn Sigler, Nick Jonas and Deborah Gibson. Music lovers will enjoy “Composing a Classic” as it highlights a delightful and intimate conversation with composer Alan Menken. For a great all-around history of the trials and triumphs of the making of “Beauty and the Beast,” watch “Beyond Beauty – The Untold Stories.” I found all three of these features to be not only informative, but also enjoyable. DVD Bonus Features: The three versions of the film, the audio commentary and the sing-along option, which are all featured on the Blu-ray disc, have also been included on the digitally restored DVD.